Two days ago, in MOA: Hainan - China's Last Province Reports ASF, we saw the first four outbreaks of ASF to be reported from Hainan; the last of China's Provinces to report the virus. Today, China's MOA has announced several additional outbreaks spread across multiple cities and counties of their southernmost, island province. The Information Office of the Ministry of Agriculture and Rural Affairs was released on April 21, and the African swine fever epidemic occurred in Xiuying District, Chengmai County, Baoting Li and Miao Autonomous County and Lingshui Li Autonomous County of Haikou City, Hainan Province. On April 21, the Ministry of Agriculture and Rural Affairs received a report from the China Animal Disease Prevention and Control Center and was diagnosed by the Hainan Provincial Animal Disease Prevention and Control Center. A farmer in Xiuying District, Haikou City, Hainan Province, two farmers in Chengmai County, Baoting Li and Miao A case of African swine fever occurred in a farmer in autonomous county and two farms in Lingshui Li Autonomous County. Up to now, there have been 252 live pigs in the Xiuying District of Haikou City, with 252 live pigs and 43 deaths. In Chengmai County, there were 172 pigs in the coexistence of two farms, with 62 diseases and 62 deaths. Baoting In the Li and Miao Autonomous County, there were 7 pigs in the coexistence of the epidemic, with 7 diseases and 7 deaths. In the Lingshui Li Autonomous County, there were 86 live pigs in the two farms, with 34 diseases and 34 deaths. This is the 7th MOA announced ASF outbreak/epidemic in the past 3 weeks, and while the pace of reporting appears to be picking up after a 2-month lull, there are still concerns we are only seeing a small slice of a much bigger crisis. Officially, China continues to report progress in controlling the disease, as in the following lede from a Beijing News report published today, which stresses the number of ASF affected regions that have been `unblocked', and rising pork prices. The country has been unblocked since the epidemic 111; pig production was a continuation of a downward trend, the second half of the pork price rose or stage. Unofficially, we continue to see persistent rumors (Google search `死猪') and media reports (see Reuters report Piles of pigs: Swine fever outbreaks go unreported in rural China), strongly suggesting that China's African Swine Fever epidemic is much bigger than official numbers would suggest. Two weeks ago, a Rabobank Research report estimated that between 150-200 million Chinese pigs have already been infected with ASF - more than all the pigs in Europe - and that China's pig production will drop 30% in 2019. With official culled numbers hovering just over 1 million pigs culled in China due to ASF (see latest FAO report), this estimate suggests the crisis could be more than 100-fold larger. It is likely that no one - not even China's MOA - has a good handle on the size and scope of China's ASF epizootic. There is a well-founded reluctance to report `bad news' up the chain of command to Beijing, as it invites central government scrutiny. And in China, that has a history of sometimes not turning out well for local officials. 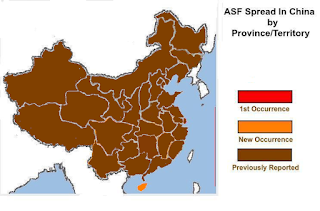 While ASF doesn't pose a direct threat to human health, is is devastating to pork producers, and its continued spread in China and across Asia could compromise already fragile food security in many regions. Earlier this week Japan's MAFF announced the 20th farm outbreak of Classical Swine Fever (CSF) since the virus returned last September. Similar to African Swine Fever (ASF) both diseases are highly contagious among pigs, and can be economically devastating for pork producers, but neither pose a direct threat to human health. 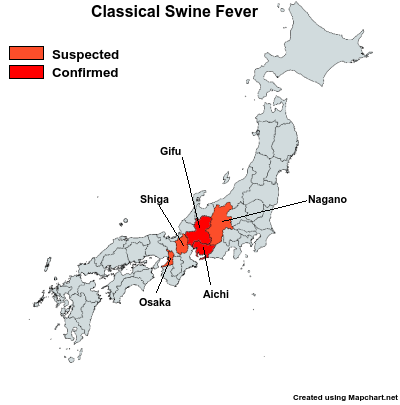 In addition to 20 outbreaks on commercial farms, hundred of wild boar - primarily in Gifu Prefecture, but also in Aichi - have tested positive for the virus over the past 6 months. This morning we've got the (translated) MAFF update on the 20th outbreak affecting nearly 10,000 pigs (including some at a local slaughterhouse), followed by yesterday's OIE update. Today, suspected affected animals of swine fever has been confirmed in a pig farm in Ena, Gifu Prefecture. We are taken all possible measures for the quarantine measures for the disease. The farm has to refrain from the movement of breeding pigs from the time the suspicion of swine fever has occurred. Interview in the field, thank you for your cooperation as strictly refrain from such that there is a risk that cause the spread of the disease. (1) Gifu Prefecture, April 16 (Tuesday), from the farm, received a report of a breeding pig has exhibited abnormal, we conducted a site inspection by animal health inspectors. (2) the same day, because the suspicion of swine fever is caused by the inspection at the Livestock Hygiene Service Center, was subjected to a thorough examination, today (April 17, Wednesday), turned out to be a suspected affected animals of swine fever want did. 1. The 20th affected farm (Ena city in Gifu, 16/04/2019) On the 16th of April, some pigs were found to be dead. That was reported to the Gifu Livestock Hygiene Service Centre (LHSC). Official veterinarians of the LHSC immediately visited the farm to conduct a clinical inspection and sampling. The samples were tested for classical swine fever (CSF) virus by RT-PCR at the LHSC. The samples were found to be positive on the 17th of April. The epidemiologically related slaughterhouse was identified and was ordered to stop its operation. Stamping out is being carried out at the 20th affected farm and the epidemiologically related slaughterhouse. This OIE update also adds 52 wild boar outbreaks, and provides the following summation. As of the 19th of April, 994 wild boars (163 dead and 831 captured) in Gifu prefecture have been tested and 318 (113 dead and 205 captured) were found to be positive for CSF virus (CSFV) by RT-PCR since 13th of September. 233 wild boars (17 dead and 216 captured) in Aichi prefecture have been tested and 13 were found to be positive (2 dead and 11 captured) for CSFV by RT-PCR since 14th of September. Among the other prefectures, 276 wild boars (253 dead and 23 captured) in 40 prefectures were tested and all were found to be negative for CSFV by RT-PCR since the 14th of September. Note: Since 24th March 2019, oral vaccine (bait vaccine) have been applied to wild boars in selected area in Gifu and Aichi prefecture where CSF positive cases have been found in wild boars. Although Japan has been battling this disease for over 6 months, the pace of reported outbreaks has increased markedly over the few weeks, with 10 of 20 farm outbreaks (50%) reported in the past 6 weeks. 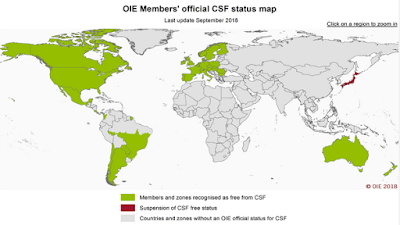 Until last September, Japan had been one of only 35 countries (see map below) that has been certified by the OIE as being free of the disease with their last outbreak reported in the early 1990s. With Japan's recent suspension, that number now stands at 34. 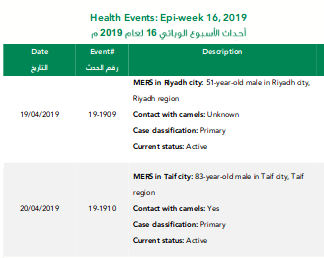 The Saudi MOH has reported two new primary MERS cases (yesterday & today), and for the first time in several weeks has listed a primary case (in Taif) as having recent camel contact. Although the number of MERS cases reported by KSA has dropped during epi week #16, a primary case in Taif - which is about 40 miles east of Mecca - just two weeks before the start of Ramadan, is a concern. I would also note there was some uncorroborated Arabic twitter traffic overnight - apparently prior to today's MOH announcement - of suspected MERS activity (كورونا) in Taif. During all of 2018, Saudi Arabia reported a total of 137 MERS cases. In the first 109 days of 2019, they've already reported 134 cases. Although a far cry from the explosive hospital outbreaks of 2014 and 2015 (see EMRO chart below), this is a substantial increase over what we've seen the past couple of years. 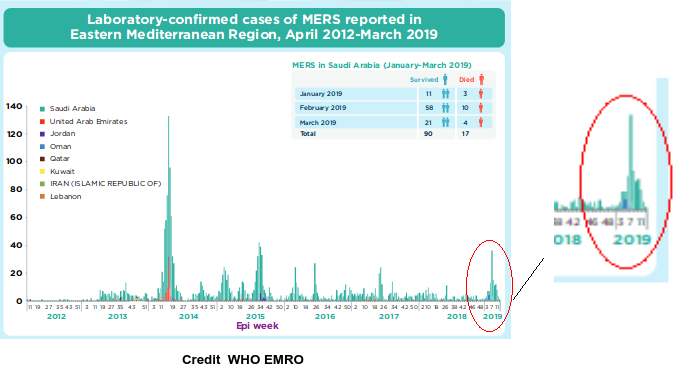 While we've not seen any indication of efficient or sustained transmission of the MERS virus in the community, the past few months has witnessed a noticeable uptick in the number of household and/or healthcare facility clusters. 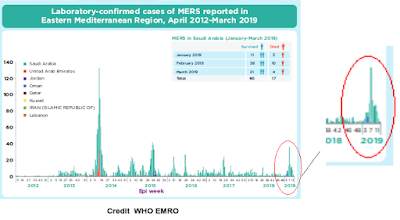 While this might indicate a change in the virus's behavior, it is also possible that after two years of decreased MERS activity, the quality and consistency of MERS infection control in hospitals - and public's concerns over contact with camels - has diminished. Constant vigilance is difficult to maintain, particularly when the threat appears to be in decline. The Holy month of Ramadan begins in just two weeks, when roughly 1 million religious pilgrims with make the journal to Mecca and other Holy sites to perform Umrah. In early August, two million more will arrive for the Hajj. Hopefully awareness campaigns will ensure that MERS fatigue won't extend to these international travelers as well. Early on Monday, October 8th 2018, not-yet-quite-a-hurricane Michael was centered over the western tip of Cuba, with tropical storm force winds of 70 MPH. The forecast was for the storm to strengthen to CAT 2 (110 MPH) winds, as it moved towards an expected Thursday landfall on the Florida panhandle. While the NHC made a remarkably accurate forecast track, things did not go exactly as forecast. A late season storm, the waters of the Gulf of Mexico were still quite warm and wind sheer was low, providing plenty of fuel and an ideal environment for rapid intensification. Within a few hours (see NHC 11am Key Messages: Hurricane Michael Now Expected To Become A Major Storm) the National Hurricane Center upped the ante. 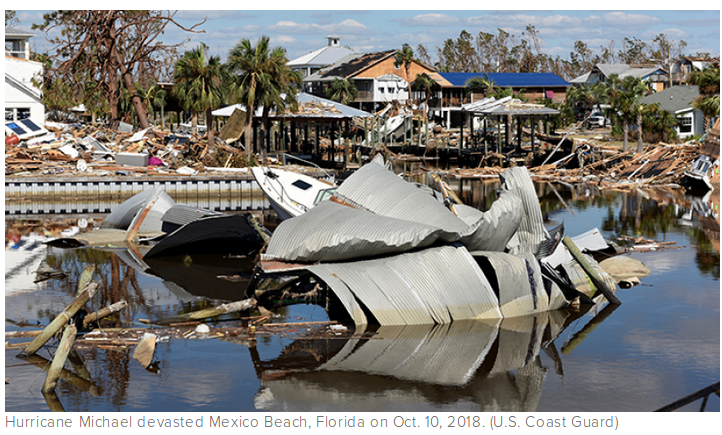 Although track forecasting has become much better over the last decade, the ability to accurately forecast rapid changes in intensity remains elusive. At 11am on Tuesday, the NHC was still forecasting a CAT 3 storm, landfalling now on Wednesday afternoon. What residents of the panhandle woke up to on Wednesday morning - just hours before landfall - was the news that Michael Was Now A Cateogry 4 storm. The good news was, Michael came ashore very close to where the NHC predicted, and many residents got out of the way. The bad news was, Michael proved far worse than anyone expected. I provide this recap - not to at all criticize the forecast - but to remind people that hurricanes are complex systems and forecasts are not perfect. If a storm is only forecast to be a CAT 3, I always prepare as if it could be CAT 5 on arrival. Which, according to the following press release from NOAA, is exactly what made landfall a little over 6 months ago on the Florida panhandle. The real-time operational intensity estimate was 135 knots (155 mph). The final best track intensity estimate of 140 knots (160 mph) was determined by a review of the available aircraft winds, surface winds, surface pressures, satellite intensity estimates and Doppler radar velocities – including data and analyses that were not available in real time. The 5 knot (5 mph) increase in the estimated maximum sustained wind speed from the operational estimate is small and well within the normal range of uncertainty. 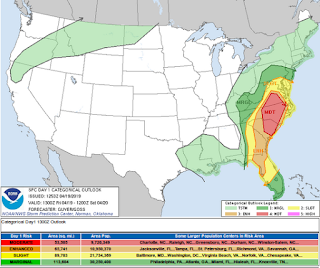 A side note: I (along with tens of millions of other across the Southeast) are under severe weather warnings today. Since power outages are common here following severe storms, I may find myself offline later today. If you live or work anywhere in the shaded areas of the map below, today is a good day to keep your NOAA weather radio on, and a weather eye out. And next month, we'll begin our annual pre-hurricane season preparedness checklist. H10 viruses are also on our radar - particularly H10N7 and H10N8 - as they have both shown a limited ability to infect humans. Sometimes with fatal results. In 2004 the first known human H10 infections (see Avian Influenza Virus A (H10N7) Circulating among Humans in Egypt) were reported, followed in 2012 by a limited outbreak among workers at a chicken farm in Australia (see in EID Journal: Human Infection With H10N7 Avian Influenza). Most of these avian flu infections were mild or asymptomatic, and self limiting. Often only producing conjunctivitis or mild flu-like symptoms. But in late 2013 a new H10N8 virus emerged in Mainland China (see Lancet: Clinical & Epidemiological Characteristics Of A Fatal H10N8 Case) infecting three people, killing at least two. While the number of reported H10 infected humans remains small - possibly due to a lack of surveillance and testing - in 2014's BMC: H10N8 Antibodies In Animal Workers – Guangdong Province, China, we saw evidence that people may have been infected with the H10N8 virus in China before the first case was recognized. While human cases of H10 infection haven't been reported since early 2014, these avian viruses continue to turn up in aquatic mammals, often producing significant mortality (see PLoS One: Pathology Of A/H10N7 In Harbor Seals). The biggest incident was in northern Europe (mostly Denmark and Germany & Sweden) in 2014, when as many as 3,000 harbor seals reportedly died from avian H10N7 (see Avian H10N7 Linked To Dead European Seals), prompting warnings to the public not to touch seals. In 2016 the journal PLoS One published an article that evaluated the virus's zoonotic potential through experimentally inoculated ferrets. The full study is available online, at Influenza A (H10N7) Virus Causes Respiratory Tract Disease in Harbor Seals and Ferrets. Subtype H10 influenza A viruses (IAVs) have been recovered from domestic poultry and various aquatic bird species, and sporadic transmission of these IAVs from avian species to mammals (i.e., human, seal, and mink) are well documented. 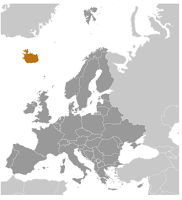 In 2015, we isolated four H10N7 viruses from gulls in Iceland. Genomic analyses showed four gene segments in the viruses were genetically associated with H10 IAVs that caused influenza outbreaks and deaths among European seals in 2014. Antigenic characterization suggested minimal antigenic variation among these H10N7 isolates and other archived H10 viruses recovered from human, seal, mink, and various avian species in Asia, Europe, and North America. Glycan binding preference analyses suggested that, similar to other avian-origin H10 IAVs, these gull-origin H10N7 IAVs bound to both avian-like alpha 2,3-linked sialic acids and human-like alpha 2,6-linked sialic acids. However, when the gull-origin viruses were compared with another Eurasian avian–origin H10N8 IAV, which caused human infections, the gull-origin virus showed significantly higher binding affinity to human-like glycan receptors. Results from ferret experiment demonstrated that a gull-origin H10N7 IAV replicated well in turbinate, trachea, and lung, but replication was most efficient in turbinate and trachea. This gull-origin H10N7 virus can be transmitted between ferrets through the direct contact and aerosol routes, without prior adaptation. Gulls share their habitat with other birds and mammals, and have frequent contact with humans; therefore, gull-origin H10N7 IAVs could pose a risk to public health. Surveillance and monitoring of these IAVs at the wild bird-human interface should be continued. Noting that these viruses `. . . showed high binding affinity to human-like glycan receptors. . . ', the authors recommended that avian H10 viruses be monitored closely, as they have some pandemic potential. Although I can find no OIE reports of avian influenza from Iceland, in 2017, in Iceland Warns On Bird Flu, we saw the Icelandic government ordering stringent precautions be taken by poultry interests, warning that it appeared likely that infected birds either have or will arrive. While relatively secluded, Iceland lies under the East Atlantic Flyway, which stretches from Northern Europe to Iceland, Greenland, and North America (see The North Atlantic Flyway Revisited), meaning that what happens in Iceland doesn't necessarily stay in Iceland. H10 viruses, while flying largely under the radar the past few years, appear to be picking up more mammalian adaptations over time. While perhaps not at the top of our pandemic concerns list, H10N8 is ranked by the CDC's IRAT list as having some pandemic potential. Two human infections with influenza A(H10N8) virus were reported by the China Health and Family Planning Commission in 2013 and 2014 (one each year). Both cases were hospitalized and one died. Historically low pathogenic avian influenza H10 and N8 viruses have been recovered from birds. A risk assessment of the H10N8 influenza was conducted in 2014. Summary: The summary average risk score for the virus to achieve sustained human-to-human transmission was low-moderate (less than 5). 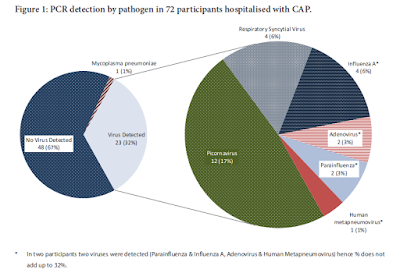 The average risk score for the virus to significantly impact public health if it were to achieve sustained human-to-human transmission was in the moderate risk range (less than 7). Late yesterday the OIE published a notification of the first occurrence of HPAI H5N6 in Cambodia, although exactly which HPAI H5N6 was detected remains unclear. HPAI H5N6 emerged in the spring of 2014 in China, Vietnam, and Laos (see FAO Warns On H5N6) - and has caused roughly 2 dozen human infections (many fatal) in China - but it isn't the only HPAI H5N6 virus in Asia. In early November of 2017 several dead mute swans were discovered in Matsue, Shimane Prefecture and were quickly determined to have been infected by an HPAI H5N6 virus. A couple of weeks later, we learned from Tottori University: The Shimane HPAI H5N6 Was A New Reassortment - not a return of the HPAI H5N6 virus which had arrived from China the previous winter. 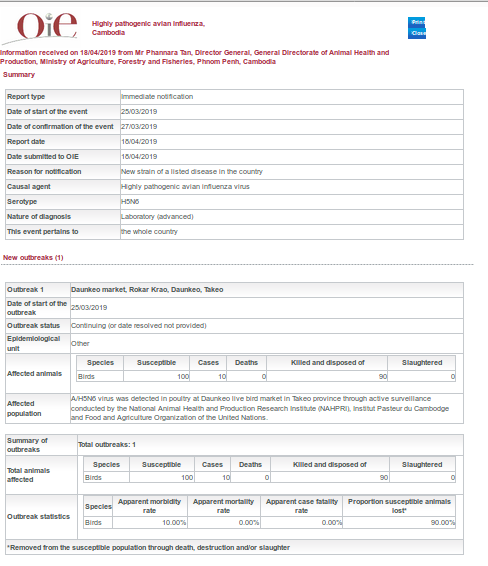 Instead this new virus was a reassortment of the H5N8 virus which had ravaged European poultry the previous winter and an (unidentified) European HxN6 virus - and was reportedly similar to another H5N6 reassortment briefly reported from Greece last March. Since then, this European-origin HPAI H5N6 has been sporadically reported in South Korea, Taiwan, Northern Europe, and elsewhere in Japan. While the name's the same - unlike its Asian cousin - this Eurasian HPAI H5N6 has no record of ever infecting humans. 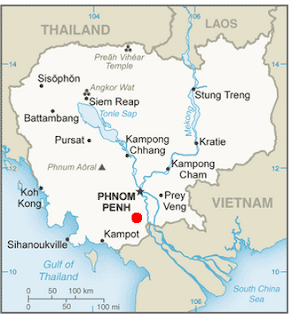 Based on the location - and the fact that neighboring Laos and Vietnam have both reported the more serious Asian H5N6 virus- it seems likely this latest report is related to the Chinese strain. But we'll have to wait for a more definitive analysis to know for sure.